POW WOW IS A GATHERING OF CONTEMPORARY ARTISTS THAT ENGAGES WITH THE BROADER COMMUNITY IN THE PROCESS AND CREATION OF ART. From February 13 to 18, 2012, Honolulu will host over thirty artists from around the world. 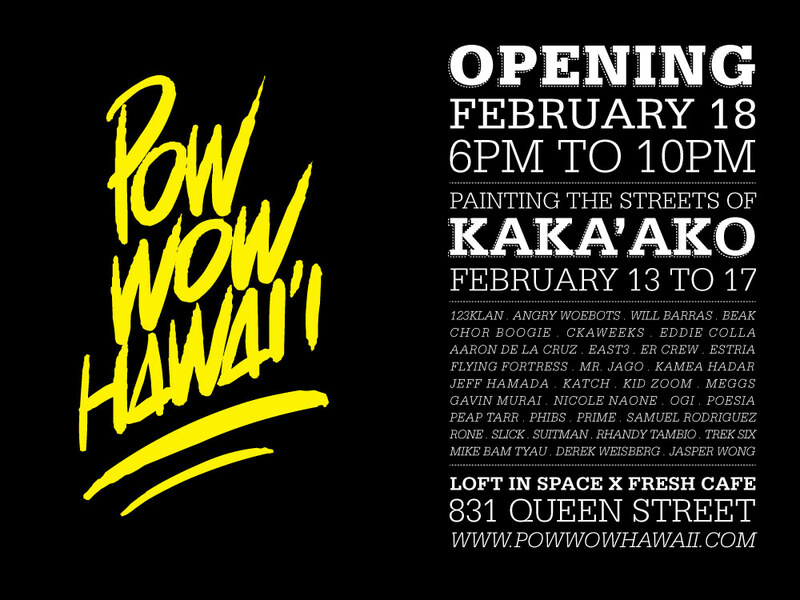 Opening and closing events will be held at Loft in Space, with the production of art being done all over the streets of Kaka’ako. During Pow Wow, the communityis encouraged to interact with visiting artists in a creative environment. The beauty of art is most commonly enjoyed during its final stage. All the blood, sweat and tears happen behind closed doors. However, that is where the real grandeur lies. The process. Imagine for a moment a gathering of internationally renowned artists in one place. A place that will allow them to do what they do best: be creative. We give them the tools, the space and the freedom to paint for one week. We make that process open to the public, allowing them full engagement and interaction between the artists and their audience. They witness the creativity in its entirety and become an essential part of the artists’ process. It’s about the breaking down of those closed doors and making art accessible. Now take a step further and imagine transforming a whole neighborhood with art within a week. Seeing creativity happen all around you from beginning to end and bringing people together through art. A POW WOW.